There are 7 fundamental types of substance. Each type has 7 substates representing the Solid, Liquid, Gas and the 4 ethers. We have forms, vehicles, in all but the 1st. When I say “we” I mean us as Spirit (Monad), Soul and Personality. Our personalities are found in the 7th, 6th and lower 4 levels of the 5th type. All types interpenetrate, that is, exist in the same space. What distinguishes one from the other is the tenuousness of the substance of which they are composed. An entity may have a form using substance of the 6th, and living a satisfying life, but not have a physical form, the 7th. Therefore we, here, are unaware of its existence unless “Continuity of Consciousness” has been developed, the ability to function simultaneously in more than one body type. It is also possible for an entity to have a physical body composed only of the 4 ethers and not possess the solid, liquid or gaseous aspects. Here again they will go unnoticed unless etheric vision has been developed. The next type from ours, the 6th, is where our emotional natures are found. The lower 4 levels of the 5th, our minds. The higher three levels, our Souls. There are unique abilities associated with each form. Each of them must be developed, awakened. On the higher levels of the 6th and inherent to the 5th is the ability of extreme magnification. It may be directed out into space or down into matter. The latter technique was used to create the book Occult Chemistry. It contains 398 pages with 230 illustrations. First published in 1908, 3rd edition 1951. OC.pdf, 48MB. Excerpts from this book will be found below. 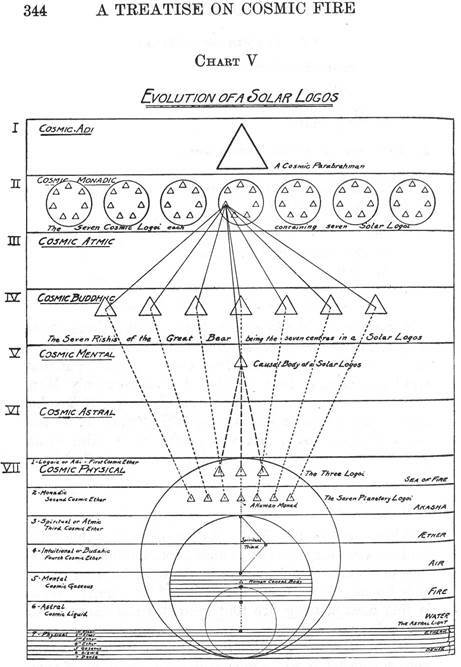 More information as to the nature of the 7 types may be found in Helena Blavatsky’s book The Secret Doctrine, look in Books, as well as a number of the books by Alice Bailey. More information on the Bailey books may be found here or download Bailey.pdf. After The Secret Doctrine had been released (1888) for some time the physicists of the day naturally had a few comments on its contents. Blavatsky addressed these in an Addenda to be found at the end of the 3rd edition, 1st volume. I extracted these pages and created the document For Our Physicists, FOP.pdf. ├ Our type, the 7th, the most material. A 1765x2553 image of the above: Chart5.JPG 728KB. 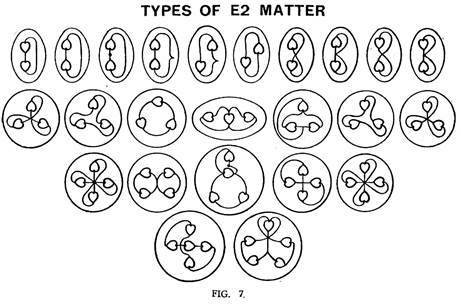 NOTE: Just as our type has 7 substates (solid, liquid, gas and the four ethers) our 7 types represent the 7 substates of the lowest of a higher series of Types. Our 7 types are simply the 7, really 49, states by which matter/substance may manifest. All is substance when examining our 7 types with one significant exception, the varying types of LIFE which manifest through substance. There will always be this duality, substance and that which is evolving by mastering its use! All forms, whether that form be an atom, a human body, a planet, a Solar System or a Galaxy, are useless without an animating LIFE. The form is eventually discarded, broken down, with the substance being used elsewhere but benefiting from its exposure to, its relationship with, the LIFE. The LIFE persists regardless of whether it is in or out of a particular form. The form has no purpose unless there’s a LIFE associated with it. Actually, initially, existence is a triplicity; LIFE, Consciousness and Form. The first develops the second via the use of the third. The first eventually discards the last two but retains all knowledge and experience acquired while Mastering their use. Relative to the lower 4 kingdoms, human/animal/vegetable/mineral, matter is a means to an end, a medium through which LIFE may manifest in order to develop/evolve consciousness. WILL eventually supersedes consciousness. This begins in the 5th kingdom. Three significant areas of discovery during the last 150 years. I don’t mean to belittle the numerous discoveries made by science during this period BUT the following are foundational, fundamental, in nature. 1). John Ernst Worrell Keely, 1837-1898. A financial supporter of his, Clara Sophia Jessup Bloomfield-Moore, wrote a book on his work, Keely and His Discoveries. The work done by this individual is the most far reaching, fundamental and transformative. If we were to achieve only his initial accomplishment, the disintegration of water, our energy needs would be resolved. From Keely and His Discoveries pages 154-155. “He disintegrated water into what he calls ‘etheric vapour’ by means of a tuning fork and a zither. The disintegration of only four drops of water produced a pressure of 27,000 pounds to the square inch, and three drops of the harmless liquid fired off a cannon ‘with a tremendous roar.’” p. 266. The Bloomfield-Moore book is available here: KeelyH.pdf. Here is what The Secret Doctrine has to say about Keely: KeelySD.pdf. 2). Thomas Henry Moray, 1892-1974. His book is The Sea of Energy in which the Earth Floats. "In the study of these pages one should consider that both matter and radiations have particle properties as well as wave properties. The particle properties are evident when recognized as highly localized events of very short duration with specific values of electric charge, energy and mass. The wave properties can be proven in different ways which have been proven and taught for so many years. "After having connected these terminals with the outside aerial and with the ground wire, Moray then took a small magnet and stroked the soft iron pole pieces above mentioned, the windings of which were connected to the interior of the boxes. He explained that the stroking was necessary to set the device into an "electrical oscillation," and that when it was "oscillating" in tune with what he called "radiant energy" it would continue so to do and bring in this energy in a usable form when the switch was closed. After this stroking had continued for a few seconds less than five minutes, Moray closed the switch and the lights came on very brilliant. The lights gave off very much more heat than the ordinary electric lights of similar voltage attached to the house circuits which with the added brilliance clearly: indicated that more than the usual voltage was going through these 100-watt lamps. This was clearly shown in another manner when the inventor took out one light and attached to this socket an ordinary Hotpoint electric flatiron of 575 watt capacity. There was no dimming of the nine remaining lights. The iron was heated with great rapidity and when in operation with the lights added was drawing from this machine 1475 watts of electrical energy." Moray1.pdf (1st Edition of his book), Moray4H.pdf (4th Edition with additional material). 3). Royal Raymond Rife, 1888-1971. An investigator, Barry Lynes, wrote a book about his work: The Cancer Cure That Worked: 50 Years of Suppression. Like Keely he used resonance to accomplish his results but here the research focused on the destruction of harmful biological infections whether they be due to invading cellular, bacterial or viral organisms. He accomplished some wonderful work. Unfortunately the AMA considerably complicated matters for him. I’ve taken excerpts from the Lynes book and created the file Rife.pdf. 4) Crytomyces pleomorphia fungi––identical morphologically to that of the orchid and of the mushroom. "With the frequency instrument treatment, no tissue is destroyed, no pain is felt, no noise is audible, and no sensation is noticed. A tube lights up and 3 minutes later the treatment is completed. The virus or bacteria is destroyed and the body then recovers itself naturally from the toxic effect of the virus or bacteria. Several diseases may be treated simultaneously. "The first clinical work on cancer was completed under the supervision of Milbank Johnson, M.D. which was set up under a Special Medical Research Committee of the University of Southern California. 16 cases were treated at the clinic for many types of malignancy. After 3 months, 14 of these socalled hopeless cases were signed off as clinically cured by the staff of five medical doctors and Dr. Alvin G. Foord, M.D. Pathologist for the group. The treatments consisted of 3 minutes duration using the frequency instrument which was set on the mortal oscillatory rate for 'BX' or cancer (at 3 day intervals). It was found that the elapsed time between treatments attains better results than the cases treated daily. This gives the lymphatic system an opportunity to absorb and cast off the toxic condition which is produced by the devitalized dead particles of the 'BX' virus. No rise of body temperature was perceptible in any of these cases above normal during or after the frequency instrument treatment. No special diets were used in any of this clinical work, but we sincerely believe that a proper diet compiled for the individual would be of benefit." All of the above is from the Lynes book. What follows is an article, a Special Supplement, written about Rife found in Everyday Practical Electronics, April 2001. Worth the read! Should you rediscover one of these technologies inform the world. Demonstrate its capabilities. If any of these technologies have been patented or copyrighted these MUST be IGNORED. These technologies are far too valuable. No one can be allowed to have exclusive rights to them except possibly the UN. Find a good lawyer. You both can make a name for yourselves and help humanity. Approach The International Court of Justice, in The Hague, to resolve this. 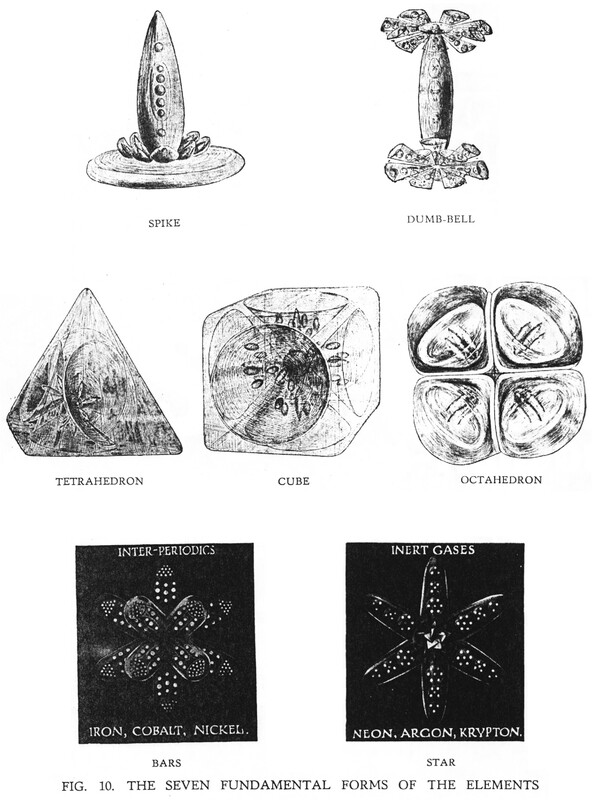 All of what follows, with the exception of one image, is taken from the book Occult Chemistry. OC.pdf, 48MB. The first chemical atom selected for examination was an atom of Hydrogen (H). On looking carefully at it, it was seen to consist of six small bodies, contained in an egg-like form, Fig. 1. It rotated with great rapidity on it own axis, vibrating at the same time, the internal bodies performing similar gyrations. The whole atom spins and quivers and has to be steadied before exact observation is possible. The six little bodies are arranged in two sets of three, forming two triangles that are not interchangeable. The lines in the diagram of the atom on the gaseous sub-plane, Fig 1, are not lines of force, but show the two triangles; on a plane surface the interpenetration of the triangles cannot be clearly indicated. The six bodies are not all alike; they each contain three smaller bodies—each of these being an ultimate physical atom or Anu. In two of them the three Anu are arranged in a line, while in the remaining four they are arranged in a triangle. The first thing that happens on removing a gaseous atom from its 'hole' or encircling ‘wall’ is that the contained bodies are set free, and, evidently released from tremendous pressure, assume spherical or ovoid forms, the Anu within each re-arranging themselves, more or less, within the new 'hole' or 'wall'. The figures are, of course, three-dimensional, and often remind one of crystals; tetrahedra, octahedra, and other like forms being of constant occurrence. It is, of course, impossible to convey in words the clear conceptions that are gained by direct vision of the objects of study, and Fig. 2 is offered as a substitute, however poor, for the lacking vision of the readers. The horizontal lines separate from each other the seven substates of matter; solid, liquid, gas, ether 4, ether 3, ether 2, ether 1. 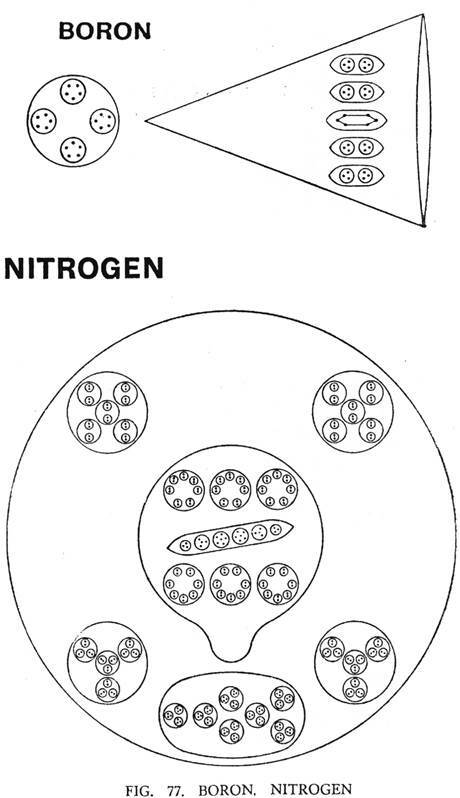 The successive changes undergone by the Hydrogen atom are shown in the compartments vertically above it. It must be remembered that the bodies shown diagrammatically in no way indicate relative size; as a body is raised from one substate to the one immediately above it, it is enormously magnified for the purpose of investigation. When the gaseous atom of Hydrogen is raised to the E4 level the wall of the limiting spheroid in which the bodies are enclosed, being composed of the matter of the gaseous kind, drops away and the six bodies are set free. They at once re-arrange themselves in two triangles, each enclosed by a limiting sphere; one sphere having a positive character, the other being negative. These form the Hydrogen particles of the lowest etheric plane, marked E4 (ether 4) in Fig. 2. On raising to E3, they undergo another disintegration, losing their limiting walls. 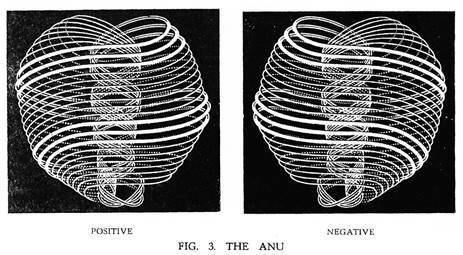 The positive sphere becomes two bodies, one consisting of the two groups distinguishable by the linear arrangement of the contained Anu, enclosed in a wall, and the other being the third body enclosed on the E4 level and now set free. The negative sphere also becomes two bodies, one consisting of the two groups of three Anu, and the second, the remaining body, being set free. 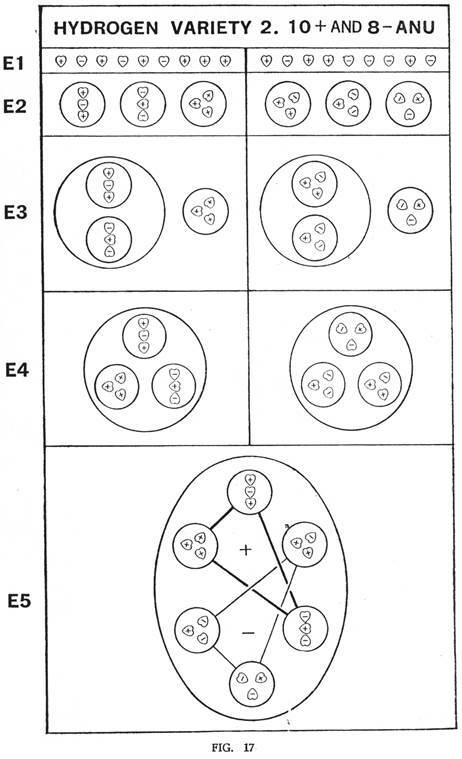 These free bodies do not remain on the E3 level but pass immediately to E2 leaving the positive and negative groups, each containing two groups of three Anu, as the representatives of Hydrogen on E3. 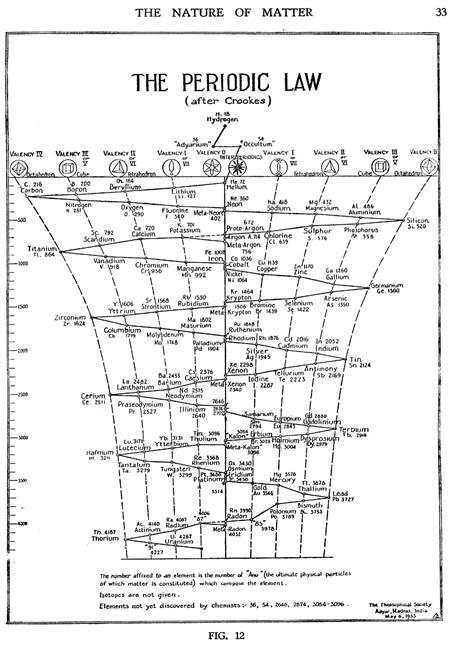 On taking these bodies a step higher to E2 in their turn, their wall disappears, and the internal triads are set free, those containing the Anu arranged lineally being positive, and those with the triangular arrangement being negative. On again raising these bodies a step further, the falling away of the walls sets the contained Anu free and we reach the ultimate physical atom, the matter of E1, the Anu. The disintegration of this sets free particles of astral matter, so that we have thus reached the limit of physical matter. Hydrogen was the first chemical element examined and has already been discussed in Chapter I. The Hydrogen atom consists of 18 Anu arranged in 6 groups, each of 3 Anu, all contained in an oval form. The six groups are at six points in space; each of the three groups making one half of Hydrogen are linked to each other across space by lines of attraction. We have thus the appearance of two interlaced triangles. Figs. 1 and 15 show the details and linking. Hydrogen atoms were not observed to move in pairs. 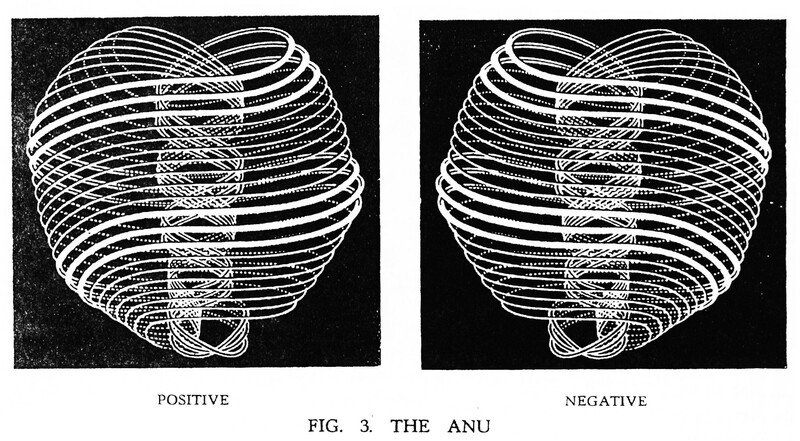 In 1908 diagrams were given of the two halves of Hydrogen, but no record was then made of the types of Anu, positive or negative, within each group of three. It was then presumed, from the general appearance of the groups, that all Hydrogen atoms were alike. In 1932, however, during a more detailed examination of the two Hydrogen atoms in a molecule of water, a second variety of Hydrogen was discovered. Hydrogen Variety 1 is composed of two halves, a positive and a negative. On examining Fig. 16 it will be seen that the positive half or triangle is composed of 5 positive Anu and 4 negative, thus making it preponderatingly positive; and that the negative half or triangle is composed of 5 negative Anu and 4 positive, thus making it preponderatingly negative. The six groups are not all alike; they each contain three Anu, but in four of the groups the three Anu are arranged in a triangle, and in the remaining two in a line. To these small groups we have given the identifying symbols H3 and H3’. In one large triangle all the three small groups have their Anu in the form of a triangle, while in the other large triangle two of the groups of three Anu are in a straight line and one in the form of a triangle. In the first edition of Occult Chemistry the two linear triplets are shown as being one in each triangle. Fig. 2. This variety was not observed by Mr. Leadbeater in 1932 and appears to be rare. The common variety is that described above and shown in Fig. 16. Hydrogen Variety 2 differs in the number of positive and negative Anu forming the atom. In the first variety there are a total of 9, positive and 9 negative Anu, in the second variety we find 10 positive and 8 negative. This variety is therefore predominatingly positive. Fig. 17. In the molecule of water, H2O, one Hydrogen atom is of the first variety and the other of the second variety. 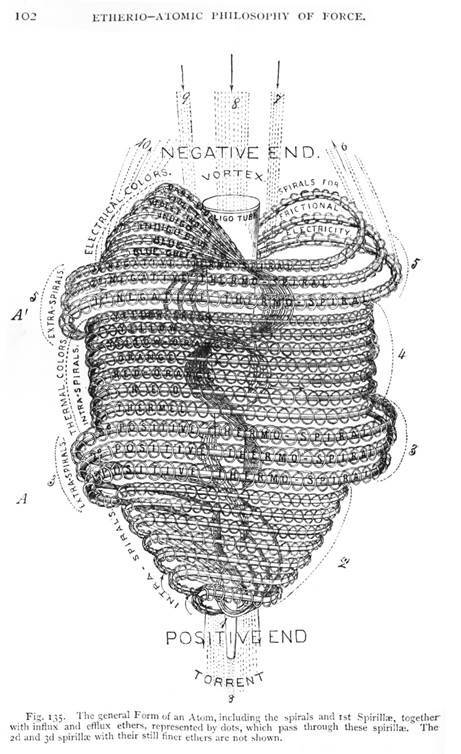 “The illustrations there given, referring to Babbitts book, of atomic combination are entirely wrong and misleading, but if the stovepipe run through the centre of the single atom be removed, the picture may be taken as correct, and will give some idea of the complexity of this fundamental unit of the physical universe.” -Mrs. Besant, 1909. Co-author of Occult Chemistry. As we have seen, a chemical atom may be dissociated into less complicated bodies; these, again, into still less complicated; these, again, into yet still less complicated. After the third dissociation but one more is possible; the fourth dissociation gives the ultimate physical atom on the atomic sub-plane, the Anu. This may vanish from the plane, but it can undergo no further dissociation on it. In this ultimate state of physical matter two types of units, or Anu, have been observed; they are alike in everything save the direction of their whorls and of the force which pours through them. In the one case force pours in from the "outside," from fourth-dimensional space, the Astral plane, and passing through the Anu, pours into the physical world. In the second, it pours in from the physical world, and out through the Anu into the "outside" again, i.e., vanishes from the physical world. The one is like a spring, from which water bubbles out; the other is like a hole, into which water disappears. We call the Anu from which force comes out positive or male; those through which it disappears, negative or female. All Anu, so far as observed, are of one or other of these two forms. Fig. 3. It will be seen that the Anu is a sphere, slightly flattened, and there is a depression at the point where the force flows in, causing a heart-like form. Each is surrounded by a field. The Anu can scarcely be said to be a "thing," though it is the material out of which all things physical are composed. It is formed by the flow of the life-force and vanishes with its ebb. The life-force is known to Theosophists as Fohat, the force of which all the physical plane forces are differentiations. When this force arises in "space," that is when Fohat "digs holes in space,"—the apparent void which must be filled with substance of some kind, of inconceivable tenuity—Anu appear; if this be artificially stopped for a single Anu, the Anu disappears; there is nothing left. Presumably, were that flow checked but for an instant, the whole physical world would vanish as a cloud melts away in the empyrean. It is only the persistence of that flow (the first life-wave, the work of the third Logos) which maintains the physical basis of the universe. In the three whorls flow currents of different electricities; the seven whorls vibrate in response to etheric waves of all kinds—to sound, light, heat, etc. ; they show the seven colours of the spectrum; give out the seven sounds of the natural scale; respond in a variety of ways to physical vibration—flashing, singing, pulsing bodies, they move incessantly, inconceivably beautiful and brilliant. The Anu is a sun in miniature in its own universe of the inconceivably minute. 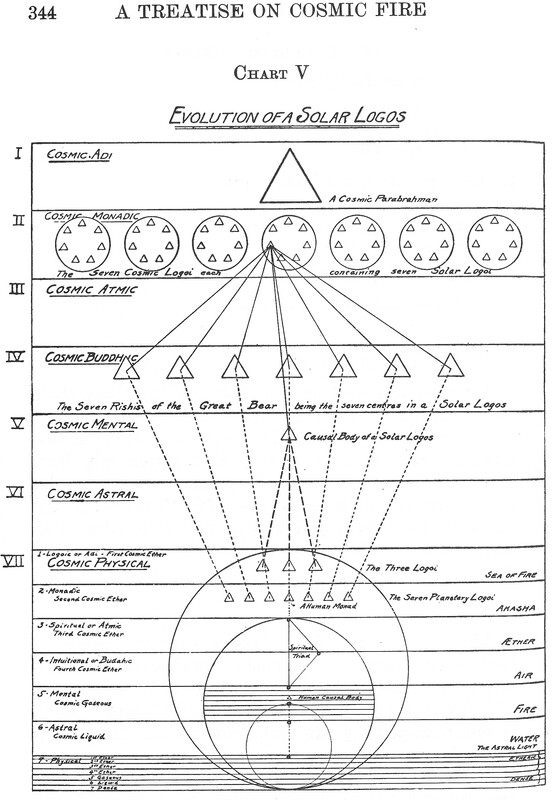 Each of the seven whorls is connected with one of the Planetary Logoi, so that each Planetary Logos has a direct influence playing on the very matter of which all things are constructed. It may be supposed that the three conveying electricity, a differentiation of Fohat, are related to the Solar Logos. Force pours into the heart-shaped depression at the top of the Anu, and issues from the point, and is changed in character by its passage; further, force rushes through every spiral and every spirilla, and the changing shades of colour that flash out from the rapidly revolving and vibrating Anu depend on the several activities of the spirals; sometimes one, sometimes another, is thrown into more energetic action, and with the change of activity from one spiral to another the colour changes. The Anu has—as observed so far—three proper motions, i.e., motions of its own, independent of any imposed upon it from outside. It turns incessantly upon its own axis, spinning like a top; it describes a small circle with its axis, as though the axis of the spinning top moved in a small circle ; it has a regular pulsation, a contraction and expansion, like the pulsation of the heart. When a force is brought to bear upon it, it dances up and down, flings itself wildly from side to side, performs the most astonishing and rapid gyrations, but the three fundamental motions incessantly persist. If it be made to vibrate, as a whole, at the rate which gives any one of the seven colours, the whorl belonging to that colour glows out brilliantly. 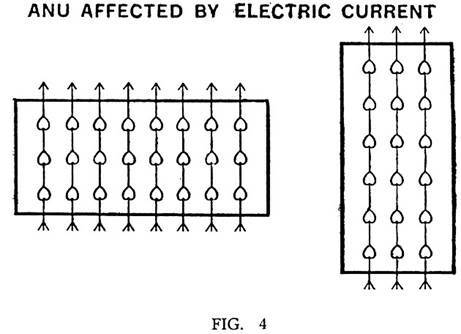 An electric current brought to bear upon the Anu checks their proper motions, i.e., renders them slower; the Anu exposed to it arrange themselves in parallel lines, and in each line the heart-shaped depression receives the flow, which passes out through the apex into the depression of the next, and so on. The Anu always set themselves to the current. Fig. 4. In all the diagrams the heart-shaped body, exaggerated to show the depression caused by the inflow and the point caused by the outflow, is a single Anu. The action of electricity opens up ground of large extent, and cannot be dealt with here. Does it act on the Anu themselves, or on molecules, or sometimes on one and sometimes on the other? In soft iron, for instance, are the internal arrangements of the chemical atom forcibly distorted, and do they elastically return to their original relations when released? In steel is the distortion permanent? It will be understood from the foregoing, that the Anu cannot be said to have a wall of its own, unless these whorls of force can be so designated; its "wall" is the pressed back "space." As said in 1895, of the chemical atom, the force "clears itself a space, pressing back the undifferentiated matter of the plane, and making to itself a whirling wall of this matter." The wall belongs to space, not to the atom. The sphere-wall of the Anu. Each Anu, as each group of Anu, whether few in number or making a large configuration as in Radium, has round it what has been termed a "sphere-wall". This enclosing sphere is at a great distance from the central group and is generally a sphere; there are a few exceptions as in Nitrogen, an ovoid. 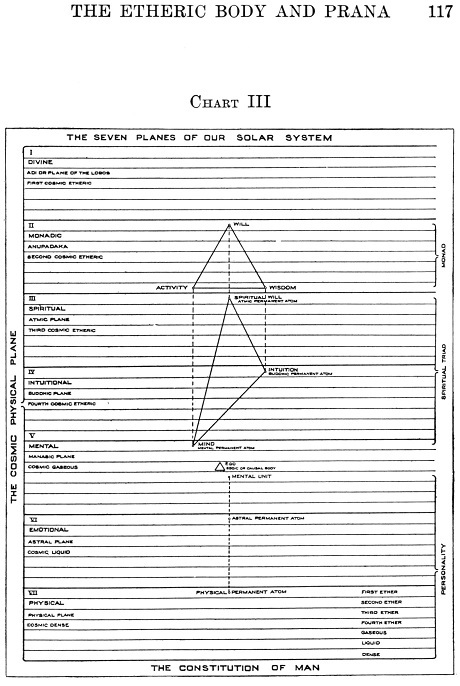 When writing out for publication the structure of the Anu, Annie Besant stated that the sphere-wall of the Anu was composed of the "undifferentiated matter of the plane". From the beginning this has created difficulties for me, since the term used by her to describe the sphere-wall could only be composed of Anu. It was only later that a special investigation was made to examine the nature of the sphere-wall of the Anu. Though there were no final conclusions on the matter, it appeared to the investigator as if the sphere-wall was composed of forces radiating from the centre, which after travelling a certain distance, returned to the centre. The nature of this radiating force was not analyzed. Therefore, though the sphere-wall appears as a part of the Anu, it is only a temporary phenomenon. It was later discovered that the sphere-walls of Anu within the solar system were all compressed by the attraction of the sun. When so compressed the sphere-wall did not, as expected, have the shape of the dodecahedron, but that of the rhombic dodecahedron. The scientific hypothesis is that all space is filled with a substance called aether, as to the constitution of which many apparently contradictory statements are made. It is thought to be infinitely thinner than the thinnest gas, absolutely frictionless and without weight, and yet from another point of view far denser than the densest solid. In this substance the ultimate atoms of matter are thought to float as motes may be seen to float in the air, and light, heat and electricity are supposed to be its vibrations. Theosophical investigators, using methods not yet at the disposal of physical science, have found that this hypothesis includes under one head two entirely different and widely separated sets of phenomena. They have been able to deal with states of matter higher than the gaseous, and have observed that it is by means of vibrations of this finer matter that light, heat and electricity manifest themselves to us. Seeing that matter in these higher states thus performs the functions attributed to the aether of science, they have (perhaps unadvisedly) called these states etheric, and have thus left themselves without a convenient name for that substance which fulfils the other part of the scientific requirements. Let us for the moment name this substance koilon (Greek word meaning "hollow"—C. J. ), since it fills what we are in the habit of calling empty space. What Mulaprakriti or "mother-matter" is to the inconceivable totality of universes, koilon is to our particular universe—not to our solar system merely, but to the vast unit which includes all visible suns. Between koilon and Mulaprakriti there must be very many stages, but we have at present no means of estimating their number or of knowing anything whatever about them. To any power of sight which we can bring to bear upon it this koilon appears homogeneous, though it is not probable that it is so in reality. It answers to scientific demands in so far that it is out of all proportion denser than any substance known to us—quite infinitely denser—belonging to another order and type of density altogether. For the very kernel and nexus of the whole conception is that what we call matter is not koilon, but the absence of koilon. So that to comprehend the real conditions we must modify our ideas of matter and space—modify them almost to the extent of reversing our terminology. Emptiness has become solidity and solidity emptiness. These units are all alike, spherical and absolutely simple in construction. Though they are the basis of all matter, they are not themselves matter; they are not blocks but bubbles. They do not resemble bubbles floating in the air, which consist of a thin film of water separating the air within them from the air outside, so that the film has both an outer and an inner surface. Their analogy is rather with the bubbles that we see rising in water, bubbles which may be said to have only one surface—that of the water which is pushed back by the contained air. Just as the bubbles are not water, but are precisely the spots from which water is absent, so these units are not koilon but the absence of koilon— the only spots where it is not—specks of nothingness floating in it, so to speak, for the interior of these space-bubbles is an absolute void to the highest power of vision that we can turn upon them. What then is their real content—the tremendous force that can blow bubbles in a material of infinite density? What but the creative power of the Logos, the Breath which He breathes into the waters of space when He wills that manifestation shall commence? These infinitesimal bubbles are the "holes" which "Fohat digs in space"; the Logos Himself fills them, and holds them in existence against the pressure of the koilon because He Himself is in them. These units of force are the bricks which He uses in the building of His universe, and everything that we call matter, on however high or low a plane it may be, is composed of these and so is divine in its very essence. The Outbreathing which makes these bubbles is quite distinct from and long antecedent to the Three Outpourings which have been so frequently discussed in Theosophical literature; it is not even certain whether it is the work of the Solar Logos or of One a stage higher still. The later Outpourings whirl the bubbles into the various arrangements which we call the atoms of the several planes, and then aggregate those atoms into the molecules of the chemical elements. The exact number of these bubbles included in an ultimate physical atom is not readily ascertainable, but several different lines of calculation agree in indicating it as closely approximating to the almost incredible total of fourteen thousand millions. Where figures are so huge direct counting is obviously impossible, but fortunately the different parts of the atom are sufficiently alike to enable us to make an estimate whose margin of error is not likely to be very great. The atom consists of ten wires, which divide themselves naturally into two groups—the three which are thicker and more prominent, and the seven thinner ones which correspond to the colours and planets. These latter appear to be identical in constitution, though the forces flowing through them must differ, since each responds most readily to its own special set of vibrations. 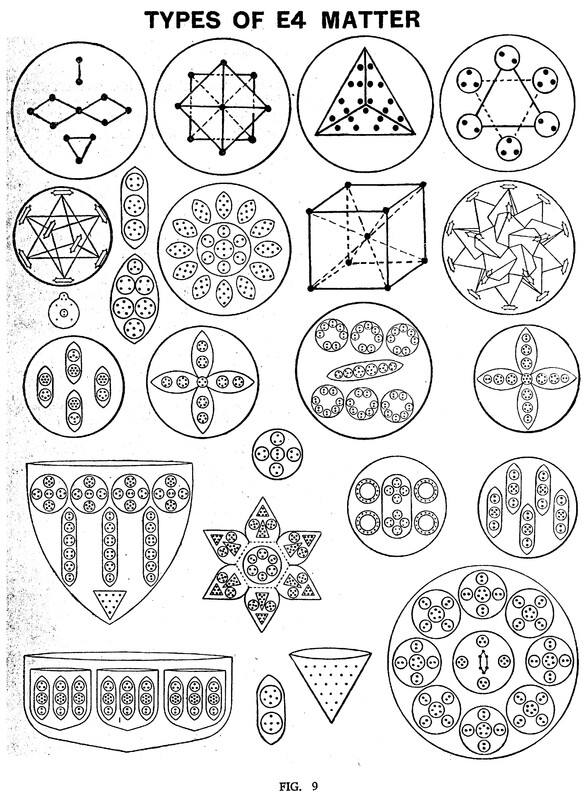 By actual counting it has been discovered that the numbers of coils or spirillae of the first order in each wire is 1,680; and the proportion of the different order of spirillae to one another is equal in all cases that have been examined, and corresponds with the number of bubbles in the ultimate spirilla of the lowest order. The ordinary sevenfold rule works quite accurately with the thinner coils, but there is a very curious variation with regard to the set of three. 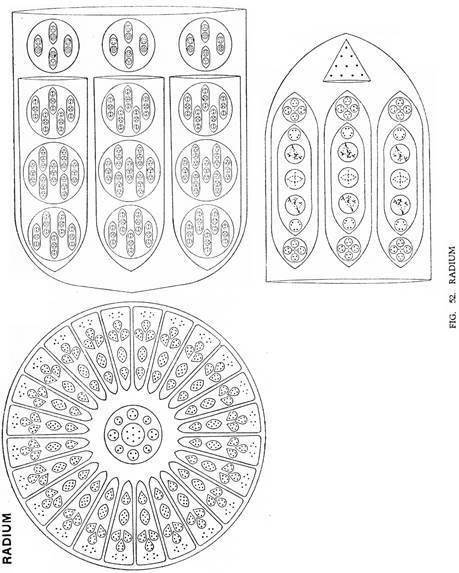 As may be seen from the drawings, these are obviously thicker and more prominent, and this increase of size is produced by an augmentation (so slight as to be barely perceptible) in the proportion to one another of the different orders of spirillae and in the number of bubbles in the lowest. This augmentation, amounting at present to not more than •00571428 of the whole in each case, suggests the unexpected possibility that this portion of the atom may be somehow actually undergoing a change—may in fact be in process of growth, as there is reason to suppose that these three thicker spirals orginally resembled the others. Since observation shows us that each physical atom is represented by forty-nine astral atoms, each astral atom by forty-nine mental atoms and each mental atom by forty-nine of those on the buddhic plane, we have here evidently several terms of a regular progressive series, and the natural presumption is that the series continues where we are no longer able to observe it. Further probability is lent to this assumption by the remarkable fact that—if we assume one bubble to be what corresponds to an atom on the seventh or highest of our planes and then suppose the law of multiplication to begin its operation, so that 49 bubbles shall form the atom of the next or sixth plane, 2,401 that of the fifth, and so on—we find that the number indicated for the physical atom (496) corresponds almost exactly with the calculation based upon the actual counting of the coils. Indeed, it seems probable that but for the slight growth of the three thicker wires of the atom the correspondence would have been perfect. It is more proper to refer to the highest plane as the 1st, not the 7th as he does. It must be noted that an ultimate physical atom cannot be directly broken up into astral atoms. If the unit of force which whirls those millions of bubbles into the complicated shape of a physical atom be pressed back by an effort of will over the threshold of the astral plane, the atom disappears instantly, for the bubbles are released. But the same unit of force, working now upon a higher level, expresses itself not through one astral atom, but through a group of 49. If the process of pressing back the unit of force is repeated, so that it energizes upon the mental plane, we find the group there enlarged to the number of 2,401 of those higher atoms. Upon the buddhic plane the number of atoms formed by the same amount of force is very much greater still—probably the cube of 49 instead of the square, though they have not been actually counted. It is also probable, though not certainly known, that the number of bubbles utilized by that unit of force is the same on all these planes, though grouped on the physical as one atom, on the astral as 49 atoms, on the mental as 2,401. Therefore one physical atom is not composed of forty-nine astral or 2,401 mental atoms, but corresponds to them in the sense that the force which manifests through it would show itself on those higher planes by energizing respectively those numbers of atoms. The first etheric subplane E1 is formed, as has been previously explained, by single Anu. 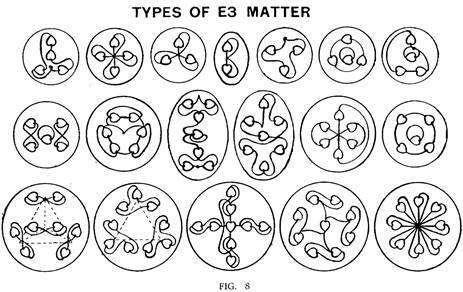 More or less complex combinations of these Anu form successively the second, E2, third, E3, and fourth, E4, etheric subplanes. The second subplane E2—The simplest union of Anu, apparently never consisting of more than seven, form the second etheric subplane. In Fig. 7 are shown some characteristic combinations of the E2 state; the Anu is conventional, with the depression emphasized. The lines, always entering at the depression and coming out at the apex, show the resultants of lines of force. Where no line appears entering the depression, the force wells up from four-dimensional space; where no line appears leaving the apex, the force disappears into four-dimensional space; where the point of entry and departure is outside the Anu, it is indicated by a dot. It must be remembered that the diagrams represent three-dimensional objects, and that the Anu are not necessarily all on one plane. 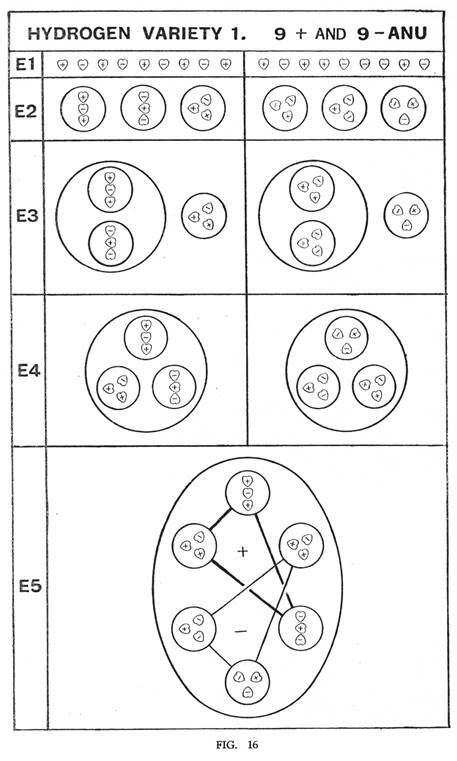 The third Etheric Subplane E3—The E3 state, in some of its combinations, appears at first sight to repeat those of the E2 state; the only obvious way of distinguishing to which some of the groups of less complexity belong is to pull them out of the "cell-wall"; if they are E2 groups they at once fly off as separate Anu; if they are E3 groups they break up into two or more groups containing a smaller number of Anu. Thus one of the E2 groups of iron, containing seven Anu, is identical in appearance with an E3 heptad, but the former dissociates into seven Anu, the latter into two triads and a single Anu. Long-continued research into the detailed play of forces and their results is necessary; we are here only able to give preliminary facts and details, are opening up the way. The fourth etheric subplane E4.—The E4 state preserves many of the forms in the elements, modified by release from the pressure to which they are subjected in the chemical atom. In this state various groups are thus recognizable which are characteristic of allied elements. These groups are taken from the products of the first disintegration of the chemical atom, by forcibly removing it from its hole. The groups fly apart, assuming a great variety of forms often more or less geometrical; the lines between the constituents of the groups, where indicated, no longer represent lines of force, but are intended to represent the impression of form, i.e., of the relative position and motion of the constituents, made on the mind of the observer. They are elusive, for there are no lines. The appearance of lines is caused by the rapid motion of the constituents up and down, or along them backwards and forwards. The dots represent Anu, within the elements. Fig. 9. 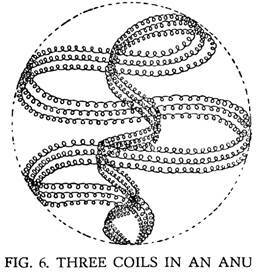 Two Anu, positive and negative, brought near to each other, attract each other, and then commence to revolve round each other, forming a relatively stable duality; such a molecule is neutral. Combinations of three or more Anu are positive, negative or neutral, according to the internal molecular arrangement; the neutral are relatively stable, the positive and negative are continually in search of their respective opposites, with a view to establishing a relatively permanent union. Speaking generally, positive groups are marked by the points of Anu being turned outward and negative groups by the points being turned inward towards each other and the centre of the group. The groups show all kinds of possible combinations; the combinations spin, turn head over heels, and gyrate in endless ways. Each aggregation is surrounded with an apparent cell-wall, a circle or oval, due to the pressure on the surrounding matter caused by its whirling motion. The surrounding fields strike on each other and the groups and rebound, dart hither and thither, for reasons we have not distinguished. *The S-matrix, which led to the S-matrix theory, which led to string theory, was first presented in 1937. This book first came out in 1908, 2nd Ed. 1919. The first thing which is noticed by the observer, when he turns his attention to the chemical atoms, is that they show certain definite forms. The main types are not very numerous, and we found that, when we arranged the atoms we had observed according to their external forms, with a few exceptions they fell into seven natural classes. Fig. 10. Each atom has a spherical or oval wall, within which the various groups of Anu move. That wall is drawn as an ovoid in the case of Hydrogen; it must be imagined in the case of every other element. A sphere-wall is a temporary effect, caused by one or more Anu in rotation. Just as a stream of air under pressure will make a hole on the surface of water, by pushing back that water, so is it with the groups. As they revolve, the force of their motion drives back the circumambient medium. That medium thus driven back by the atom element as it moves round its axis is the space around it which is filled with millions of loose Anu; it also drives back denser parts of what is called astral matter. For instance the medium driven back by each separate funnel in Sodium is astral atomic matter. 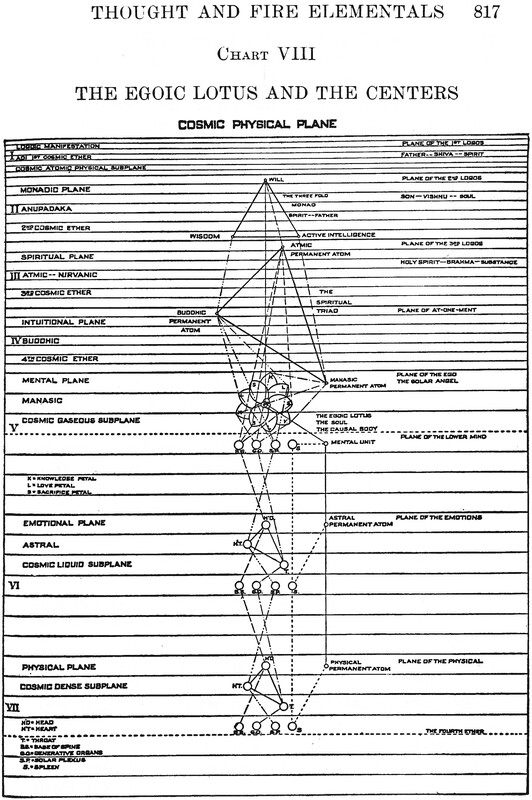 In the seven clearly defined forms it is worthy of notice that in divalent elements four funnels open on the faces of a tetrahedron ; in trivalent, six funnels on the faces of a cube; in tetravalent, eight funnels on the faces of an octahedron. Here we have a regular sequence of the platonic solids, and the question suggests itself, will further evolution develop elements shaped to the dodecahedron and the icosahedron? 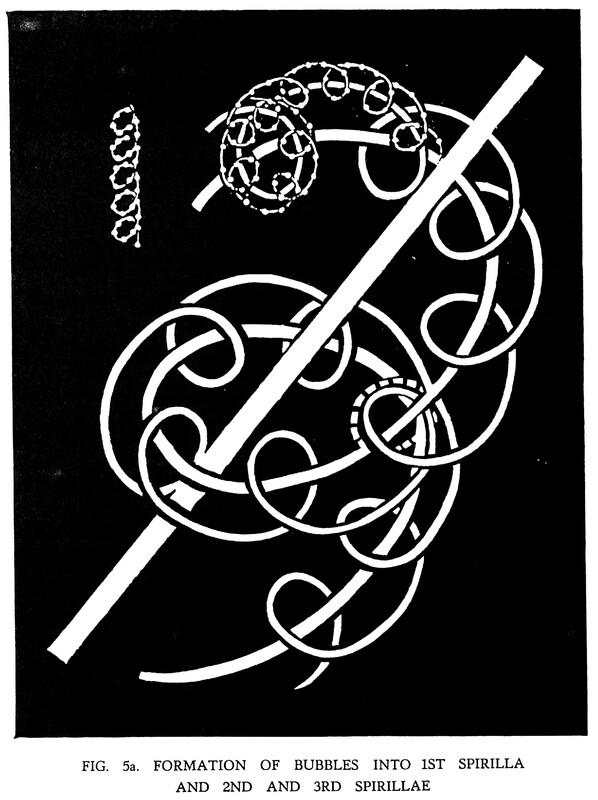 In the line depicting a pendulum swinging backwards and forwards, all the elements are marked in their order of weight; the lightest, Hydrogen, beginning the pendulum swing, and the heaviest, Uranium, (and possibly one or more heavier, yet to be discovered) closing the swing. Among the upright lines is a middle one, and there are four on either side. If the middle perpendicular line represents no valency, and also interperiodicity, and if the four lines on either side of this median line represent Valency 1, Valency 2, Valency 3, and Valency 4; then, it is found, as the elements are mapped out in the order of their atomic weights, at the intersecting points of the pendulum line and the nine upright lines, that the element appear in order of Valency. With a few exceptions, elements with similar external forms fall on the same vertical line. This may be seen on reference to Figure 12. First come 4 elements which are formed before the swing of the pendulum begins. These are ovoids. The Spike Group.—The atoms of each of the elements consist of a number of spikes radiating from a central globe in the centre of a plate-like form. The Dumb-bell Group.—The atoms of this group consists of a central rod at the ends of which we find a globe. From each of the globes project 12 funnels. The whole making a form like a dumb-bell. The elements in the dumb-bell and the spike group are those usually considered by chemists as having a characteristic valence of one or seven. They are found to right and left of the central line. The Tetrahedron Groups.—The atoms of this group have four funnels, containing ovoid bodies, opening on the face of a tetrahedron. The funnels generally, but not always, radiate from a central globe. There are two tetrahedron groups at opposite sides of the central line of the pendulum swing. Their characteristic valence is two or six. The tetrahedron seems to be one of the favourite forms of nature and appears repeatedly in the internal structure. There are two tetrahedron groups, to right and left of the central line. The Cube Group.—The cube appears to be the form of trivalent elements. It has six funnels containing ovoids and opening on the faces of the cube. There are two cube groups, at the left and right of the central line. The Octahedron Group.—Here we find eight funnels opening on the eight faces of an octahedron. The elements are tetravalent. The two octahedron groups occur at the extreme left and right of the swing of the pendulum. The Bars Group.—This is the characteristic shape of sets of three closely allied elements termed interperiodic. Fourteen bars, or seven crossed, radiate from a centre. This group occurs on the central line. The Star Group.—A flat star, with five interpenetrating tetrahedra at the centre, is characteristic of this group, which comprises the inert gases. This group occurs on the central line.